The NBA All-Star Game will take place Sunday in Toronto, and the uniforms have all sorts of noteworthy themes and design elements. The uniforms are the latest in a series of NBA All-Star designs dating back to 1951 — designs that have ranged from sedate to outlandish, from classy to garish, from half-court buzzer-beaters to air balls. If you break them down, however, you’ll see that they fall into five distinct eras. Let’s take a look at those eras chronologically, shall we? The All-Star Game’s first installment was in 1951. 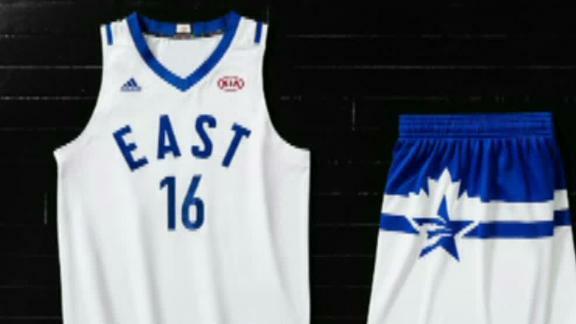 The uniforms for that game didn’t even have East or West identifiers — they simply had stars. By the late 1950s, East and West had been added to the jerseys, as you can see in this shot of St. Louis Hawks forward Bob Pettit posing with the MVP trophy from the 1958 game. The fairly generic-looking East and West designs persisted until 1967, when the league made a key decision to have the All-Star uniforms patterned after the unis of the host team. That year’s game took place at the Cow Palace in San Francisco, home of the Warriors, who had just started wearing their tremendous “The City” uniforms. The resulting All-Star design was easily the best up to that point and is arguably still the best All-Star uniform the NBA has ever had. Want to see more? Here’s some video footage from that game. The “dress like the host team” system worked better in some years than in others. In 1968, for example, the game was played at Madison Square Garden in New York, so the uniforms were patterned on the Knicks’ design. Nothing wrong with that, but the Knicks’ no-frills look didn’t lend itself to a particularly distinctive All-Star treatment. Things looked better in 1972, when the Lakers were the host team and the uniforms were instantly recognizable as being Lakers-themed, from the number font to the colors. Want to see this game on video? Here you go. Trivia footnote: This was one of several NBA All-Star Games in which Lakers great Jerry West, who of course played for the Western Conference, had the unusual distinction of wearing his surname name on the front and back of his uniform. He was also named the MVP of this game — a nice crowning touch with the game on his home court. Other strong years during this period: 1975 (when the game was played in Phoenix), 1977 (Milwaukee) and 1980 (Washington). Oddly, there were two years during this period when the league didn’t stick to the team-themed script: 1978 (when the game was played in Atlanta) and 1979 (Chicago). The uniforms for those years saw the NBA abandoning the host teams’ templates in favor of a more freewheeling approach. Those two aberrational designs in 1978 and ’79 turned out to be a bellwether for the next era of NBA All-Star uniforms, as the league abandoned the host-team-themed motif and tried a variety of new approaches. The designs at the start of this period were fairly tame, but the uniforms got increasingly adventurous as the years went on. Those 1995 and ’96 designs appeared to herald a new era of All-Star zaniness, but the league decided to step back from the ledge. You know how the players in the MLB All-Star Game just wear their regular team uniforms? The NBA tried that for six seasons, giving the game a white-versus-colors look. The crazy quilt of different designs was fun to see on the court, and fans got to root for their favorite players wearing their familiar unis. With Michael Jordan’s final All-Star appearance slated for 2003, the league decided to abandon the MLB-style approach and revive the uniform Jordan wore in his first NBA All-Star Game in 1985 — an All-Star throwback uniform, essentially. It was interesting to see how the design looked when worn in the baggier style that Jordan helped pioneer. The dozen years since then have seen the game look increasingly like the NFL Pro Bowl (whose uniforms we examined a few weeks ago), with eye-catching uniforms that have often fallen into the “What were they thinking?” category. That brings us up to date. But if you want to look ahead, there’s a good chance we’ll be starting a new era in NBA All-Star design in 2018. That’s when Nike will be producing the game’s uniforms for the first time. Paul Lukas figures an All-Star advertising patch is OK, because the game is just an exhibition, but is still dead set against ad patches for games that count. If you liked this column, you’ll probably like his Uni Watch Blog, plus you can follow him on Twitter and Facebook. Want to learn about his Uni Watch Membership Program, be added to his mailing list so you’ll always know when a new column has been posted or just ask him a question? Contact him here. October 17, 2018 Comments Off on Caffeine Consumption and Rosacea Risk: What’s the Link?